Schonstedt Instrument Company, in partnership with the United Nations Mine Action Service and the US Department of State, continues to deploy donated magnetic locators to underserved countries through the Schonstedt Humanitarian Demining Initiative. To date, more than 500 units have been shipped to demining teams in 28 countries. 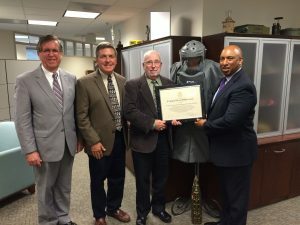 The Society of Religious Friends (Quakers) of Woodstown, NJ has been responsible for the donation of over 100 of those units, and was recently honored by the US Department of State, Bureau of Political- Military Affairs, Office of Weapons Removal and Abatement at a ceremony in Washington, DC. Frank Lenik and Jack Mahon accepted a Certificate of Appreciation on behalf of the Woodstown Monthly Meeting for its members’ ongoing contributions to the dramatic reduction in civilian deaths and injuries from landmines and unexploded ordnance. The post US State Dept. Honors Demining Efforts appeared first on Schonstedt.